Much like pixels on a computer screen, printed items are composed of small spots of color that are indiscernible to the human eye. If a printer is using CMYK colors, they are creating your entire print job using only a combination of Cyan, Magenta, Yellow, and Key (black) spots. This works remarkably well, but it is impossible to match every color exactly using this system. When a printer uses the term “spot colors” they are referring to an ink color, other than CMYK, that is custom mixed to match your specifications. At FoldedColor, our ink technicians and printers are well accustomed to working with spot colors. Our goal is to produce a finished product that matches your specifications exactly. FoldedColor prints all cartons in 7 color process. This way 80% of all spot colors can be matched. Contact FoldedColor with your specific Pantone® colors and we will let you know how well FoldedColor can match your colors. 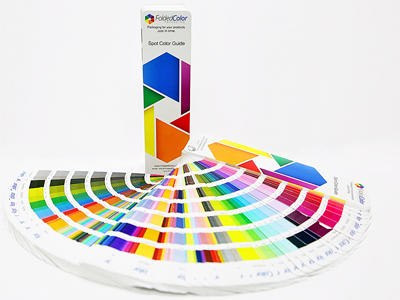 We utilize the Pantone® Plus Series to maintain the accuracy and excellence of our spot colors. This next generation of the Pantone® Matching System with new features and capabilities allow us to match most spot colors.